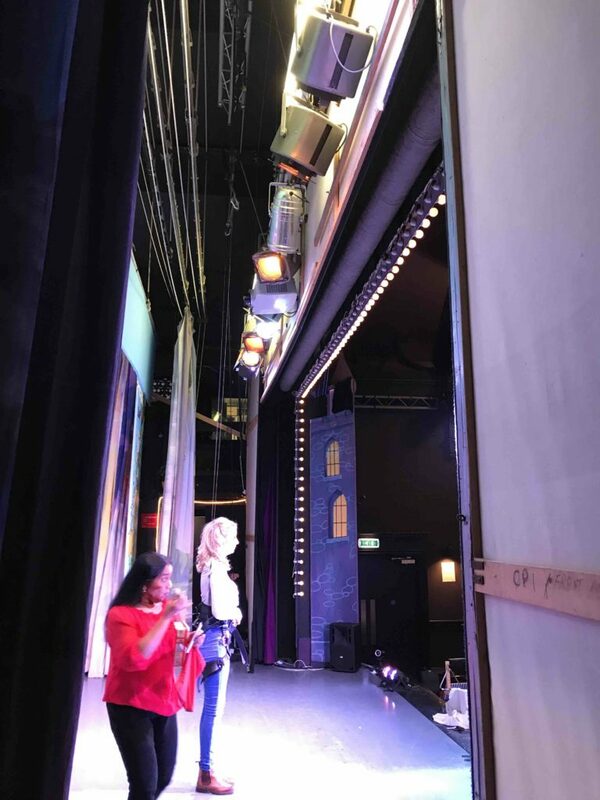 So I started writing this blog at the beginning of Panto – December 2017 – It’s now April, so thought I better finish it off. I had the pleasure of working on PPP’s Production of “Cinderella”. A 3-week run (thank god..) of magic, fun, corny jokes, dancing, and singing. General Set Building and Assistance. (Not much ey?) 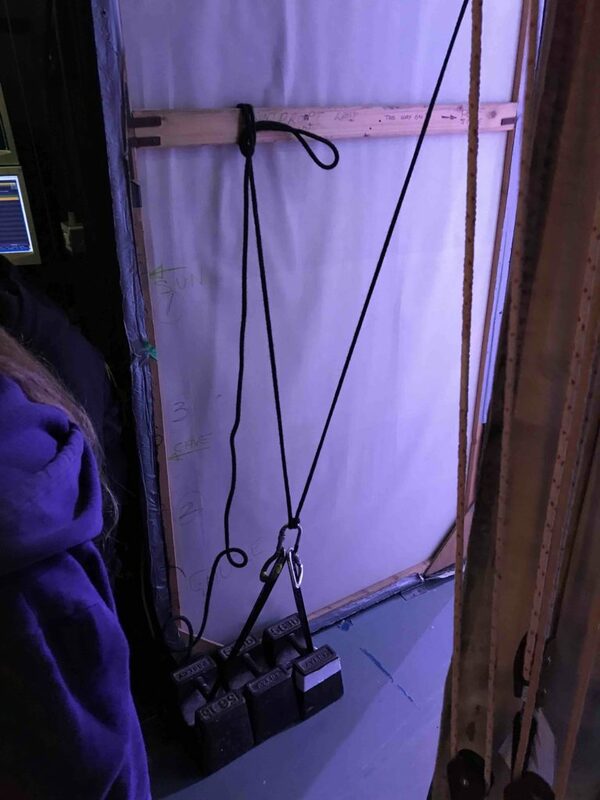 In this post, I will talk about some of the setup, equipment used, and some of the magic that goes on behind the scenes. LX Rig, Cloth Rig, Portal Rig with cast call in the evening. LX Rig Complete, finish set, sound rig, Plot LX Act 1, cast call in the evening. Plot SFX, make further changes to Plot for LX Act 1, make changes to Plot for LX Act 2 , technical rehearsal in evening. SFX Plot changes, LX Plot changes, any other changes made. Dress Rehearsal in evening with the invited audience. This is something I’ve had little to no experience with before, and with virtually no grid height, this was going to be a challenge, but what the show wants – the show will get. Here is a sneak peak of what the final outcome was. This, I’m sure would have had a good feature on “Dodgy Technicians” – But, safety was paramount. We created the flying with a mixture of struts, straps and a lot of patience. The triangle trusts were hung into the grid, stropped, strapped, tapped, cable tied – you name it, it was secured and not coming down for anyone! 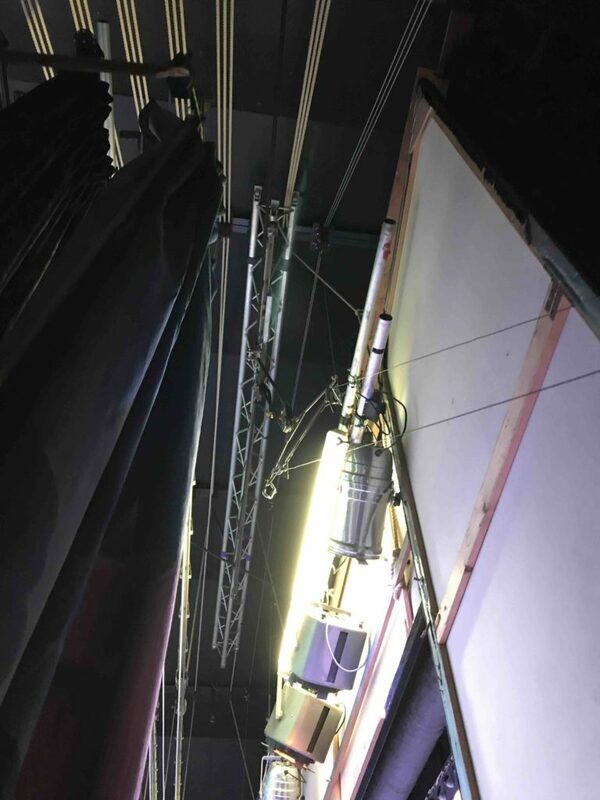 Attached to the trusting, was an old tab track – affixed using the same methodology as above, with pullies and ropes heading to stage right for the lifting, and the movement to that side, with another pully and ropes to stage left, for the movement that side. Everything was pre and post checked on each show to ensure the safety of the performer and everyone else. 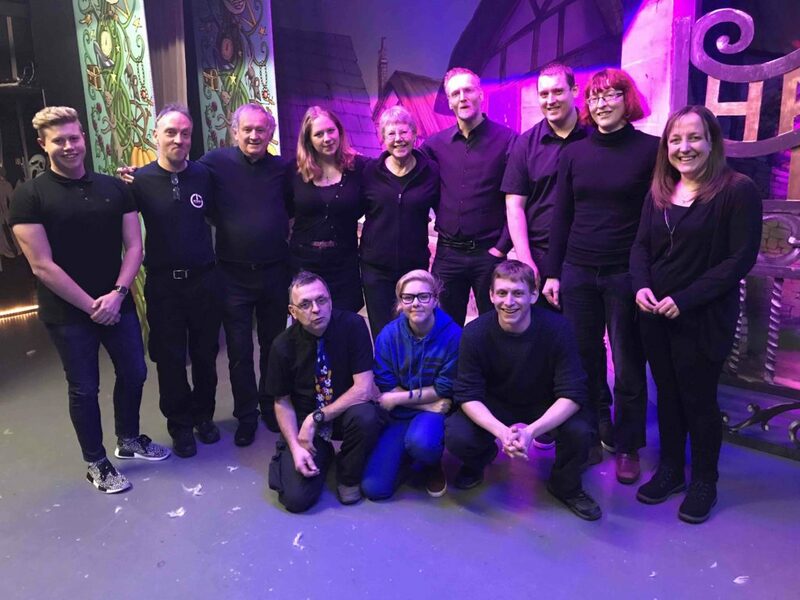 For this production, was already mentioned I was responsible for Lighting Design, and Lighting Programming, one of my colleagues John then has the responsibility to operate the show for the run. The first time that I see it or know much about it, wasn’t until I meet with the Stage Manager and discuss what is required for the show. Panto, is generally a nice bright wash, with some vivid colours, movement and some special effects. Easy. During the evening cast calls, I take the opportunity to film this, so I can use this for future reference when plotting (both Sound and Lighting). I put my own touch of lighting into the show, sitting down with the stage manager we bounce ideas off of each other, and I place it into practice. Once done, we will run it at the cast call, of which we find out where there are some issues or we wait for the director afterwards to come up with suggestions for change. We have a majority of LED in the rig, consisting of LED Pars, LED Battons, some Tungeson 743s, Harmony Floods, Profile Spots, custom golf ball 3 channel pros chase, smoke, haze, and around 16 moving heads. I was running this off the Zero 88 Orb XF. Below is a sneak peak of the last show finale lighting state. For this production, as already mentioned I was responsible for Sound Design, and Sound Operation for every show over the run. For this production, we ran 22 radio microphones for the actors, and a full band. Drums, Bass, 2 x Keys, Effects Pad, Flute, Trumpet and Trombone, and PC Playback. I was running this off the Yamaha LS9. 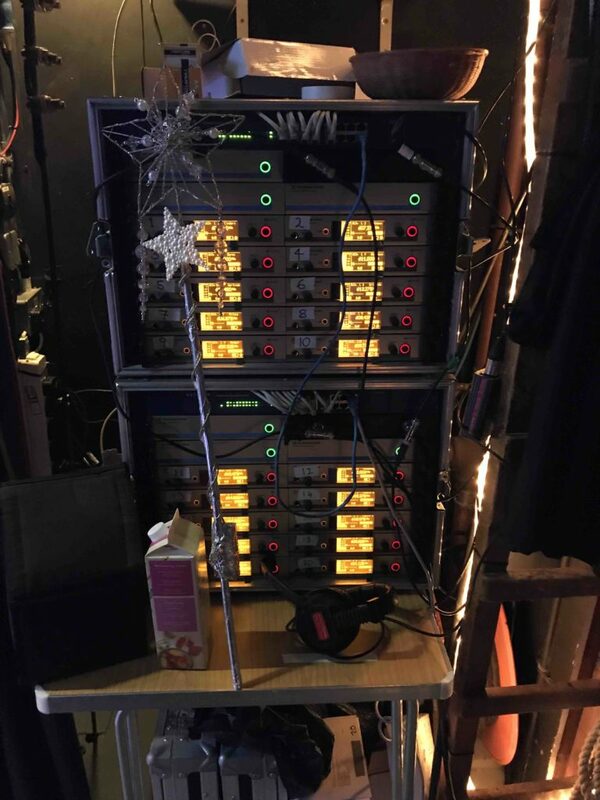 Below is a picture of our side stage microphone rack – Sennheiser G3s. I get a list of character names on the first day of fit up, so I can prep the microphones, headsets and programming. Once the sound was all in, on one of the cast calls I get all actors with microphones to run through a sound check – saying lines, and singing some lines to EQ and compress where necessary, and then the band. There are a majority of sound effects in the show, as well as some recorded voice (which was quickly put together). Following the script, marking the script and the desk is paramount to be correct – as some effects are crucial to the show and punch lines. Below is a sneak peak of my set up, I was also running projection. 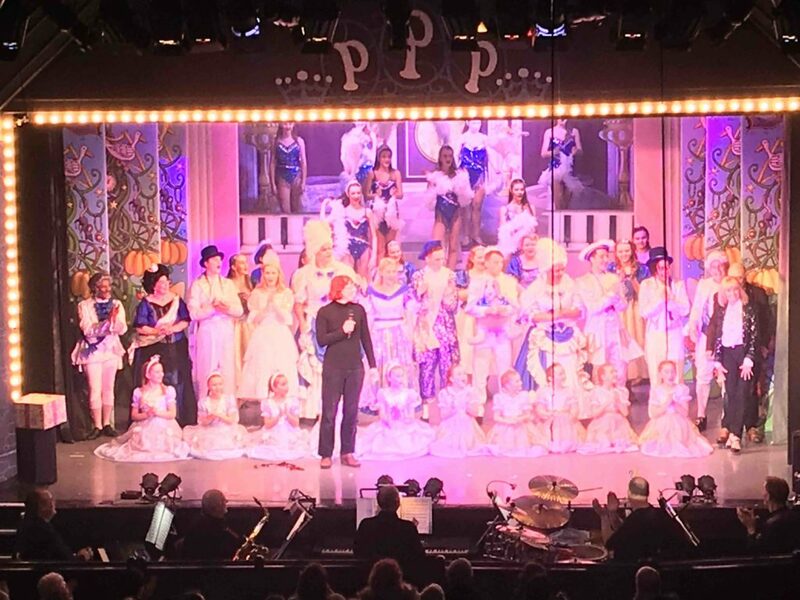 All in all this was a great production, which won the NODA award for best pantomime, and was nominated for the Stage Electrics Award for Technical Achievement. I’d like to say a big thank you to my crew, and the production crew for being apart of this great production. 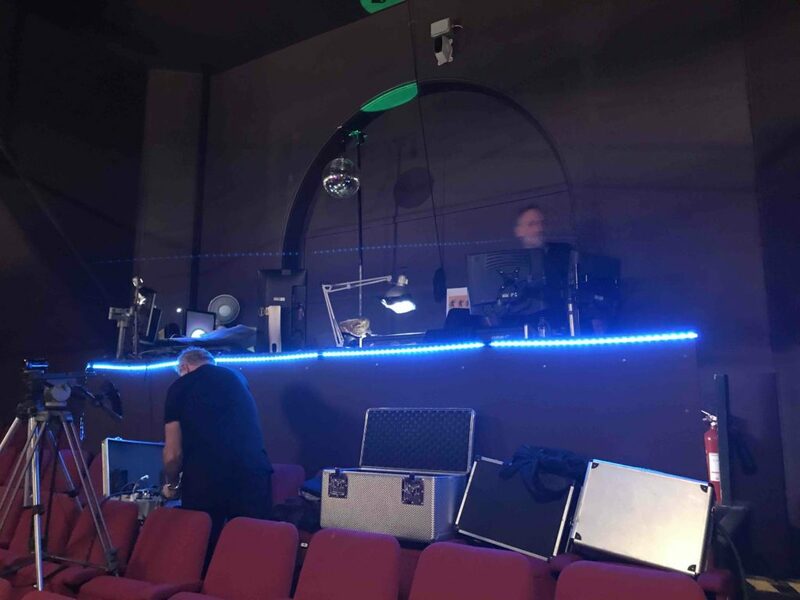 Oh, and John (Lighting Op) was really getting into Panto – so on the last night he brought along some LED Rope light, a mirror ball and some other funky lighting – we had a party the last night at the tech box. Excellent work as always Lee!! Well done on the flying fairy! !